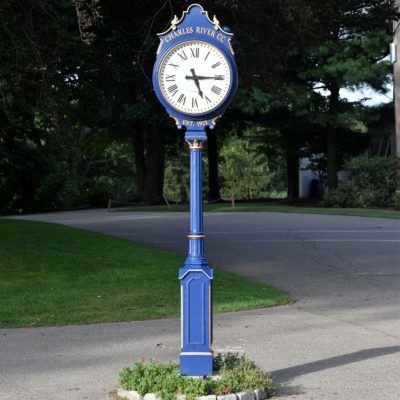 Charles River Country Club Street Clock – Raised lettering and a custom color. Since 1928 Electric Time has been manufacturing quality standard and custom architectural clock products. 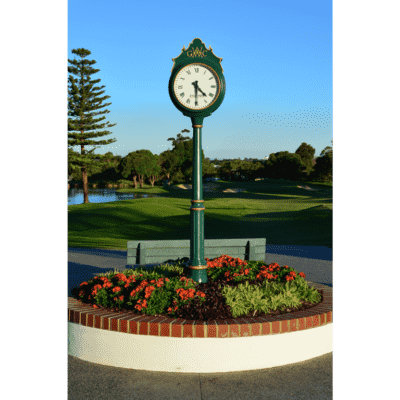 Our standard line of street clocks are available from 8’6″ (2.6 meters) to 19′ (5.8 meters) tall for Clubhouse or Golf Course applications. The Golf Club Clock catalog is available in a PDF format. Click here to download our entire Golf Club Clock brochure or you may browse it in the viewer below. To view the downloaded PDF file, you will need the Adobe Acrobat Reader.